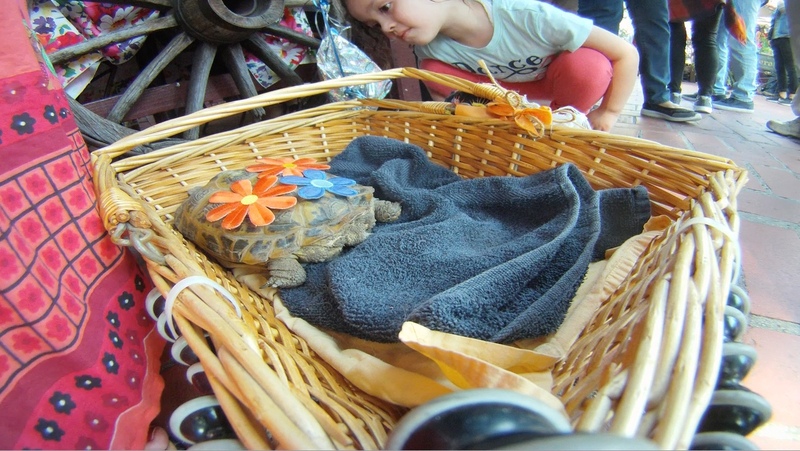 We’ve been coming to Olvera Street’s annual Blessing of the Animals event since 2004. First a couple years with Shadow and then one with Ranger. Buster, our 18ish-year-old Russion tortoise, has been the designated representative of the various pets of our household every year since 2007. This is the second year that we’ve joined with the fine folks at the Reptile & Amphibian Rescue Network and been a part of the initial processional. Last year we lucked into accompanying them basically by being at their booth wherein they invited us, and this year we did the same thing, thereby getting ceremoniously doused with the holy H2O by Archbishop Jose Gomez at the front of the long line of other pet owners, and allowing Susan and me to quickly get to the real reason for coming downtown: margaritas at La Golondrina. 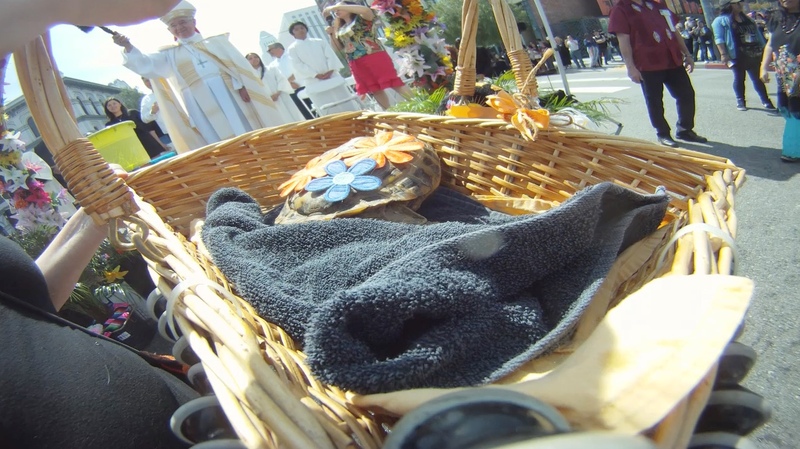 I set up our GoPro on a corner of Buster’s basket and timelapsed from prior to the event’s commencement of the procession to well into our lunch. 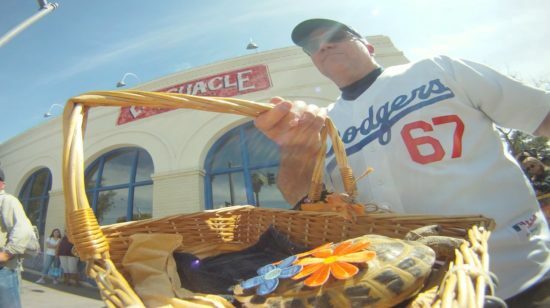 The following stills pulled from the video show Buster and me prior to the event; the moment a bemused Archbishop Gomez flings water in our general direction; Buster in line at La Golondrina with a curious little girl; and lastly the moment Buster escaped the confines of the basket. Thankfully her freedom was short-lived thanks to Susan’s sharp-eye. 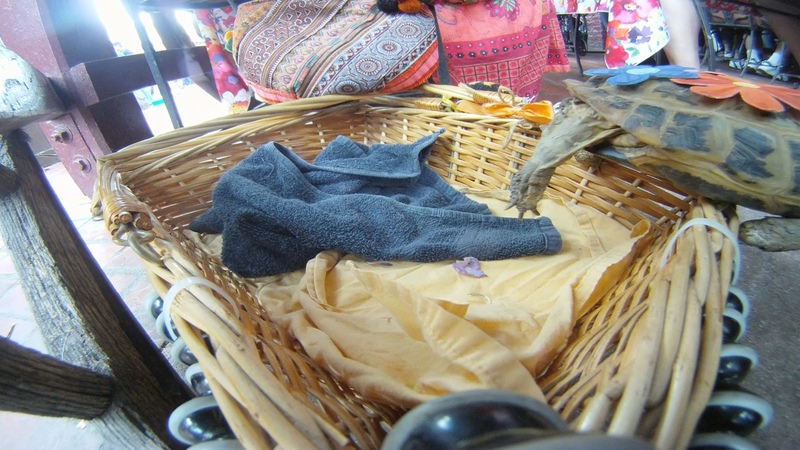 This entry was posted on Monday, April 2nd, 2018 at 7:18 am and is filed under animals, downtown, happenings. You can follow any responses to this entry through the RSS 2.0 feed. Both comments and pings are currently closed.